The contours and consequences of the uprising in Egypt—which, after decades in which Hosni Mubarak destroyed the civil society of his country and stifled the most elementary aspirations of his people, was perfectly inevitable—are still unclear. About the justice of the protestors’ anger there can be no doubt. But the politics of the revolt are murky. Its early stages have not been the work of the Muslim Brotherhood, but it is hard to believe that the Islamist organization will not be tempted to play the Bolshevik role in this revolution: it has the ideology and the organization with which to seize control of the situation, and it is the regime’s most formidable political adversary. The army may decide, with the government seriously wounded and robbed of any semblance of legitimacy, to do more than bring order to the streets. Mubarak, in a characteristic act of a failing dictator, has fired his cabinet, as if the ire of the Egyptian people was directed at his ministers: a pathetic move that brings to mind the memory of the Shah of Iran’s eleventh-hour reshuffle of his doomed government. We know this script. The political popularity, and political authority, of Muhammed ElBaradei is also hard to measure. Continue? There is nothing wrong with crisis management in a crisis, but the problem that the Obama administration now confronts is precisely that it has not been a cornerstone of American policy toward Egypt to stand up for the rights of the Egyptian people. It has preferred cronyism with the regime occasionally punctuated by some stirring remarks. What we are witnessing, in the confusion and the dread of the administration, are the consequences of its demotion of democratization as one of the central purposes of American foreign policy, particularly toward the Muslim world. There were two reasons for the new liberal diffidence about human rights. The first was the Bush doctrine, the second was the Obama doctrine. The wholesale repudiation of Bush’s foreign policy included the rejection of anything resembling his “freedom agenda,” which looked mainly like an excuse for war. But whatever one’s views of the Iraq war, it really does not seem too much to ask of American liberals that they think a little less crudely about democratization—not only about its moral significance but also about its strategic significance. One of the early lessons of the rebellion against Mubarak is that American support for democratic dissidents is indeed a strategic matter, and that the absence of such American support can lead to a strategic disaster. Such are the wages of realism. It is a common error that prudence is thought about the short-term; the proper temporal horizon for prudential thinking is distant and long. Realism does not equip one for an adequate appreciation of the historical force of the democratic longing. In this sense, realism is singularly unrealistic. It seems smart only as long as the dictators remain undisturbed by their people, and then suddenly it seems incredibly stupid. Obama replaced the freedom agenda with an acceptance agenda. His foreign policy has been conducted in a vigorously multicultural spirit. He rightly sensed that an emphasis upon democratization was a critical emphasis—a castigation of the existing dispensations in countries ruled by autocracies and authoritarianisms, and he did not come to castigate. He came in friendship, to “restore America’s standing.” He sought to do so with an embrace of differences, an affirmation of religions, a celebration of civilizations. As a matter of principle, such assertions of respect are right and good. But what if the positive tone misses the point—not about the dignity of other peoples, but about their actual circumstances? Of what use is happy talk to unhappy people? Do societies desperately in need of secularization and its blandishments really need the American president to cite their Scripture to them? In accordance with his warm new priorities, democracy was the fourth of Obama’s five themes is his speech in Cairo in 2009, the one called “A New Beginning.” When he finally got around to it, he introduced it this way: “I know there has been controversy about the promotion of democracy in recent years, and much of this controversy is connected to the war in Iraq. So let me be clear: no system of government can or should be imposed by one nation by any other.” Or: the United States will no longer bother you about how you are living. He then proceeded to a fine little sermon about the virtues of government “through consent, not coercion,” but said nothing about the political conditions in Egypt. 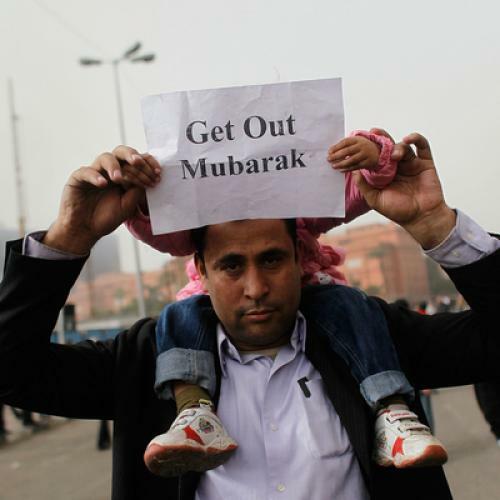 The Cairo speech did not discomfit the Mubarak regime. I imagine that many of Obama’s listeners in Cairo that day are on the streets of Cairo today, and some of them attacked the American Embassy. It was a terrible mistake for Obama to make democratization seem like an “imposition,” with its imperialist implications, and to conflate it with military invasion. The promotion of democracy is a policy of support for indigenous Egyptian, or Arab, or Muslim democrats who are just as authentic as indigenous Egyptian, or Arab, or Muslim autocrats and theocrats, and certainly more deserving of American respect. It is a policy—to borrow Gibbs’s words—of taking sides—specifically, of taking sides with peoples against regimes. It does not create dissidents, in some sort of ugly-American conspiracy; it finds them, and then it assists them, because they are in need of assistance, and because assisting them expresses our values and our interests. To be sure, there are instances in which our interests and our values may collide, because anti-democratic and anti-American forces may come to power by means of a democratic process; but there is no surer way to bring them to power than to ignore the illegitimacy of a tyrannical government and the ordinary grievances of a repressed population. The bizarre irony of Obama’s global multiculturalism is that it has had the effect of aligning America with regimes and against peoples. This was the case with our response to the Iranian rebellion in 2009, and it was the case with our response to the Egyptian opposition until a few hours ago. The striking thing about Barack Obama’s “extended hand” is how utterly irrelevant it is to the epochal events in Egypt, and Tunisia, and Iran, and elsewhere.